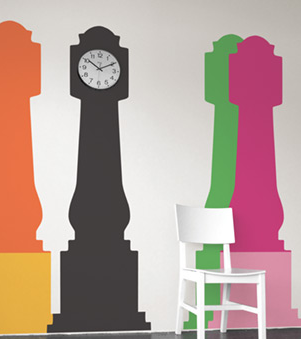 These colorful + fun wall graphics, designed by BY:AMT for Studio Jan Habraken, are a fab addition to your small space. Hey if you have no room for a real standing clock, this one will certainly do. Using your walls at it's finest! 4 Responses to "CUTE: Classic Furniture Via Wall Graphics"
We have a long, narrow hallway in our little place, and I've wanted to put up something like this. The clock idea sounds really fun; thank you for the website. I've bookmarked it until I make up my mind on exactly how to swankify the space. YES! I love this idea! I just bought some wall decals by Blik. They have a really cute one in the form of a chandelier. very lovely color...smart idea too. Casamodern has a collection of great Modern Classic Furniture and decoration ideas for your home.